If you have an LG washing machine, it's likely you're no stranger to its error monitoring system. LG washers display their error codes on the machine's front panel to help make troubleshooting your LG washing machine easier. LG washer codes are two letters and can appear for a large number of washer faults. These codes help you understand what the issue is, and whether you can fix it yourself at home or will need to call in a professional. The two letters of each error code stand for two words that indicate what the problem is. IE: A water inlet error meaning that the machine is not getting enough water. DE: A draining error, which means the water in the machine is having trouble getting out. UE: An unbalanced error, regarding the load you're trying to wash – either it's too big, too small or in some way unbalanced. dE: An open door error; the door of your LG washer is still open. PF: An unexpected power failure during a cycle. You can likely fix any of these errors by yourself at home. To fix an IE error, you should check the water supply. There may be a blockage or kink in one of the water pipes. To fix a DE error, again check the water supply. Kinks or blockages can cause issues with water draining as well as getting to the machine. Keeping your filters clean can help prevent both these errors. If you're seeing the UE code, take a look at the load you're trying to wash. If it's likely the load is too small, bulk it up a little. If it's more likely the load is too big, split it over two washes. You may also just need to correct the load in the machine to balance it – i.e., make sure it isn't all crammed onto one side of the drum. The dE code can be another indicator your load is poorly sized. You should never have to force your washing machine door closed – if you are, then your load is likely too big. If you're seeing the pF code, you may want to check the power supply of your machine. If your plug is loose, or you know you experienced spotty power during the cycle, restart the machine and try the cycle again. Some LG washing machine codes indicate a problem that you usually cannot fix yourself. These are codes for which LG recommends contacting a professional, as they tend to indicate faults with machine parts that may need to be removed and replaced. Provide this error code to LG or a washing machine professional to help speed the process along. tE: A problem with the temperature gauge. This code can sometimes be followed by a number. FE: The water is overfilling because of a faulty water valve. PE: A problem with the pressure switch. CE: An issue with a motor overload. DHE: A dry heater error. EHE or ELE: A more general heater error. 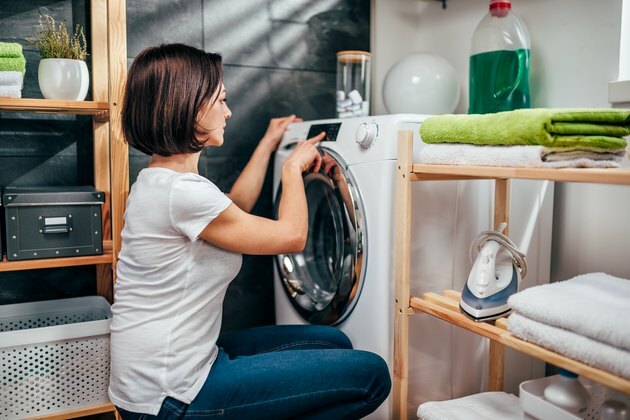 If any of these issues occur, LG recommends you close the washing machine door, unplug your machine at the wall and contact the company as quickly as possible.